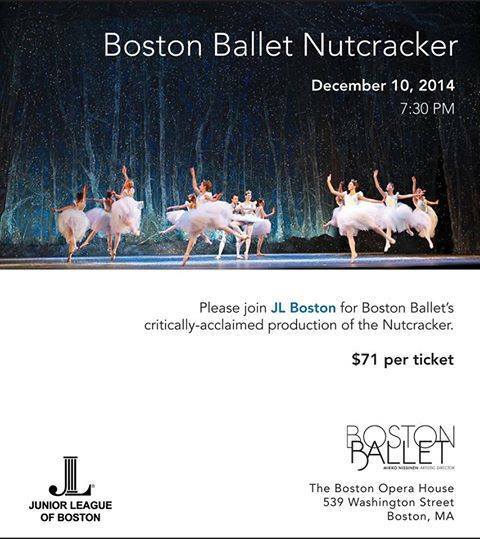 Development Event - The Nutcracker - The Junior League of Boston, Inc. There are many opportunities to give to JL Boston’s mission while experiencing the city’s culture. Attending The Nutcracker is a holiday tradition in my family—it just wouldn’t be Christmas without it! My younger sister was a part of a professional dance company growing up so, in turn, every Christmas upon my return from college I was enlisted by my mother to be the ‘junior costume mistress’ for the company’s seven performances of The Nutcracker (in five days!). As a junior costume mistress, I was allowed the privilege of an insider’s look at the production of this Christmas classic. I cannot even begin to count how many times I have seen The Nutcracker, yet it never ceases to amaze me. I have the utmost respect for dancers as they translate a series of movements into a story. As my sister and her friends transformed into sugar plum fairies, toy soldiers and mice, their dance moves seemed almost effortless as they portrayed this quintessential Christmas story. However, after watching numerous dress rehearsals, I knew this could not be farther from the truth. The literal blood, sweat and tears that were shed as the dancers tirelessly worked to perfect their routine are a true testament to hard work and dedication. Like any athlete, dancers are acutely aware of their bodies and recognize the importance of looking after them so that they can perform optimally. A performance is the culmination of hours of practicing the same routine to ensure a perfect execution, but it is also representative of months of commitment to fueling their bodies appropriately. Although my sister no longer performs in The Nutcracker, I always make sure to see it every year. Last year I was fortunate enough to see the world-renowned Boston Ballet perform The Nutcracker and was absolutely blown away by the spectacular costumes and beautiful dancing. Boston Ballet dancers are a prime example of individuals who understand the importance of nutrition and physical activity. The Nutcracker will always serve as a reminder of true dedication, as behind the elegant dance moves and picturesque costumes I know that there were months of hard work and discipline to perfect their routine, while also treating their bodies properly. The Junior League of Boston’s mission is to promote health and wellness among women in the community. The Junior League of Boston is thrilled to partner with Boston Ballet to promote our mission of health and wellness among women. We hope that you and your family and friends can join us for this magical holiday event this holiday season!